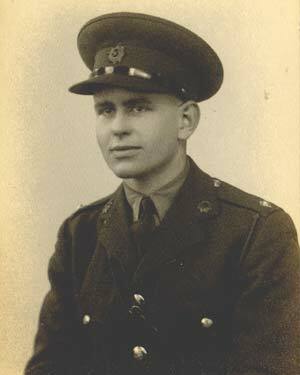 2nd Lieutenant George F Taylor, R.A.S.C. During the Second World War Ardmore Distillery was closed and was taken over by the Royal Army Service Corps and became known as Command Supply Depot, Kennethmont. The depot was a central supply of food for the military forces and Prisoner of War camps over a wide area of the North East. A sizable camp was established at the bottom of Earlsfield's field, behind Ardmore Cottages, comprising a parade square and Nissen Huts. Pre- fabricated buildings were erected between the main road and the warehouses and these were used as offices. Facilities included a bakery, a butchery and a NAAFI. Considerable quantities of foodstuffs were stored in the bonded warehouses at Ardmore and other large buildings nearby, with regular deliveries arriving via the adjoining railway sidings. Officers in charge of the Depot were billeted in the Mansion House at Leith Hall, home of the Hon Mrs Leith Hay. Mrs Leith Hay was no stranger to soldiers living in her home, Leith Hall having been used as a Red Cross Hospital throughout The Great War. Following the deaths of her husband and son in 1939, it may be that she took some comfort in having men folk living and working at Leith Hall again. One of these was 2nd Lieutenant George Frederick Taylor of Catford, London. George was educated at Maidenhead County School and prior to military service he was Chief Buyer on the staff of the British Glues and Chemicals Company Ltd having previously worked for the London Brick Company. George joined the army in 1940 and was commissioned in January 1942 and it is believed he arrived at Kennethmont CSD shortly after and took command of an 18 man Supply Detachment. Undoubtedly his former field of expertise was put to good use in the procurement, storage and distribution of supplies at CSD, Kennethmont. 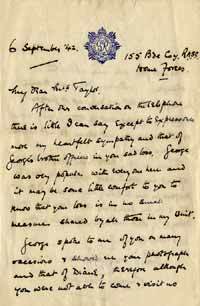 George Frederick Taylor was the eldest child of Frederick and Nellie Taylor. He had a brother Reg and a sister Audrey. George married Marjorie Eileen Bell on 2nd September 1939, the day before war was declared, and their daughter Dîane was born in February 1942. 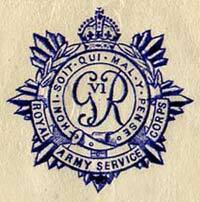 Marjorie had to move in with her parents when her London home was commandeered by the army. Her father worked in the London office of Lloyd's Bank. When their offices were moved out of London to Salisbury in Wiltshire to escape the German blitz on the capital Marjorie moved there with her parents and lived with them at Harnham Road in Salisbury. 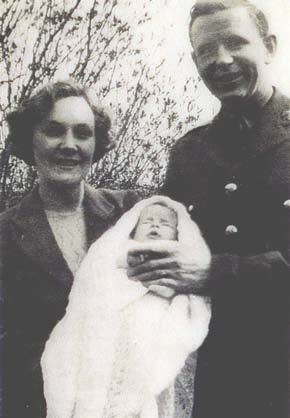 It is believed the photograph opposite was taken around April 1942 but it is known that George went on leave on 24th July and travelled to Salisbury to be with his wife and baby daughter. Their lives were destined to be changed forever by George's untimely death shortly after his return to Kennethmont. It is known that a meeting was taking place at Leith Hall on the evening of 5th September 1942 and that one of those attending discovered on his arrival that he left some papers behind. George's batman was about to go back for them when George told him to finish setting up and that he would go for them in a Staff Car. On finding there was no car available he took an army motor cycle which he found propped against a wall at Leith Hall. It is understood that this machine had been newly taken out of service with a fractured king pin ( connecting the front fork and handle bars ) and should have been labeled "Not to be driven under any circumstances". If driven and the king pin sheared completely the rider would be unable to control the machine. This is precisely what his daughter understood had happpened at about 7.20pm and that George was thrown from the machine and collided with a telephone pole or tree. He was killed outright suffering fractures to his skull and neck. 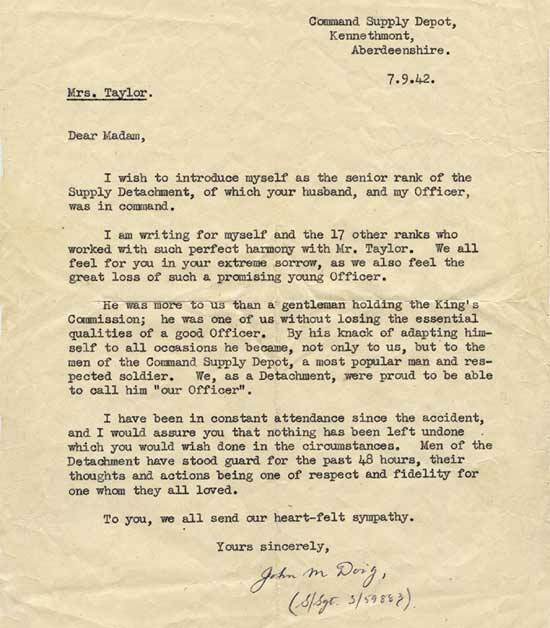 It is known from S/Sgt John Doig's letter that the men of Georges's detachment were greatly saddened by the death of "our Officer" and that he was a greatly admired, popular and well respected soldier. They stood guard over his coffin for several days and later escorted it to the Railway Station to commence the journey South to London. A full military funeral took place of 10th September and George, aged 25 years, was laid to rest at Hither Green Cemetery, London. The firing party and buglers came from Woolwich Barracks. 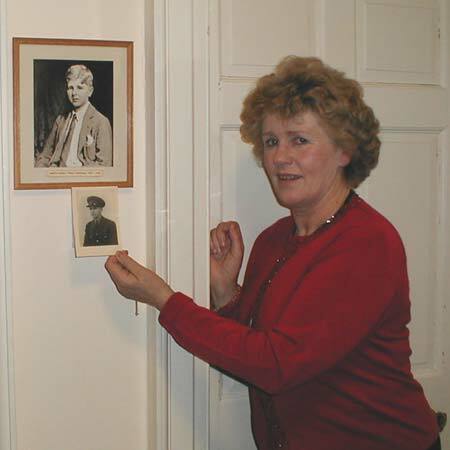 Update 2003 : Following her visit to Leith Hall George's daughter authorised me to contact the Ministry of Defence on her behalf in order to try to discover if any papers existed regarding her fathers death. They confirmed that a Court of Inquiry had investigated Lt Taylor's death but that these records were classified, and for internal service use only. Upon appeal, that these records were the only way Diane could discover the exact details and location of the accident, they agreed, exceptionally, to provide a summary of the records. This confirmed that Lt Taylor was travelling from Ardmore to the Depot Sports Meeting being held at the playing field. It may be that he had returned to the camp for something and was travelling back. Near the Leith Hall East Lodge he overtook an army utility wagon. The witness, driving the wagon, observed that when 20 yards in front of the lorry George appeared to have difficulty with his steering and crashed into a telegraph pole after scraping along the wall for five yards. A drawing of the scene confirms the motor cycle mounted the verge and travelled 28 feet before striking against the wall and later colliding with a telegraph pole. It also confirms that Lt Taylor was thrown some distance from the machine. The wagon drew up ten yards in front of the scene and the driver observed that " 2nd Lt Taylor was beyond human aid ". 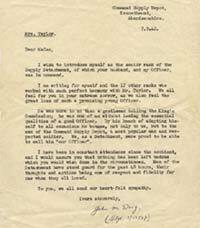 The report points out that Lt Taylor was travelling at a normal spped and did not appear to be going unusually fast. Although, in many ways, similar to the version of events given to Diane by her mother, there is no suggestion in the report that the motorcycle was not roadworthy. I am now aware of two local men who remember the accident taking place on a Sports Day. The Sports were a regular part of the life of the community for many years after the war ended. It was due to mutual cooperation between the Army and locals that this annual event was started. members of the Detachment under George Taylor's command. It is known that Mrs Leith Hay was greatly affected by George's death. George was travelling from her home when he met his death in the days leading up to the 3rd anniversary of the tragic death her only child in similar circumstances. There were also an uncanny number of coincidences linking Georges death and that of her son Charles, the last Laird of Leith Hall. Both men were Army officers on active service, both died in motor cycle accidents, they were of similar appearance, both were commissioned in January on the year of their death, both died of head injuries in September, both died on a Saturday and both were schooled in Berkshire. After George's funeral Mrs Leith Hay invited Marjorie Taylor to come up to Leith Hall where she stayed with her for six weeks. Although their family backgrounds were worlds apart, both women united in their grief, became firm friends. Mrs Leith Hay gave her a gold neck pendant, a gift at the time of her wedding, for Diane who stayed at Salisbury with her grand parents. The women kept in touch by occasional letter and card during the coming years. Diane had been told about her father, Leith Hall, Mrs Leith Hay and her mother's visit to Kennethmont and was determined that one day she would make the long journey to Kennethmont and the scene of the fatal accident. Now a widow herself living in Chelmsford, Essex, Diane's dream was realised at the beginning of October 2002, exactly 60 years after her fathers untimely death. On planning the visit last year she discovered that The National Trust for Scotland let out a self catering apartment at Leith Hall and that it was possible for her and two friends to spend their holiday in the house her father had stayed in and had left shortly before his death. To stay at Leith Hall, perhaps sleeping in the very room her father had used, was the climax of her visit. All images on this page appear by kind permission of Diane Kelsey.